More than $1 million swung from gamblers to Las Vegas sports books Sunday when the Dolphins scored a 69-yard touchdown to pull off a shocking 34-33 upset win over the Patriots. The “Miami Miracle” was a nightmare for New England bettors. More than $1 million swung from gamblers to Las Vegas sports books Sunday when the Dolphins scored a 69-yard touchdown on a pass and double lateral on the final play of the game to pull off a shocking 34-33 upset of the Patriots. 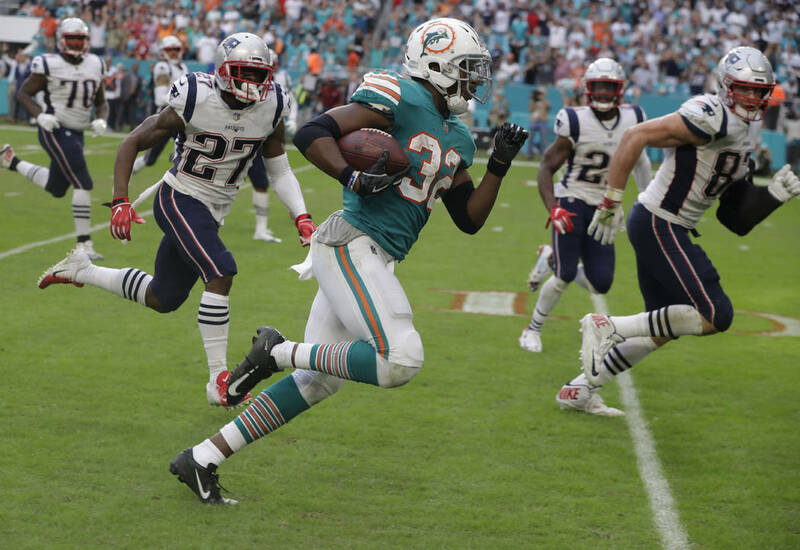 Kenyan Drake ran the last 52 yards for the longest game-winning TD from scrimmage as time expired in NFL history. With apologies to Jerry Seinfeld, Patriots bettors don’t love the Drake. New England closed as a 9-point favorite after the line was at 7½ most of the week. The point spread wasn’t affected by seemingly the first last-second lateral play that has worked since Cal-Stanford in 1982. But the extraordinary ending killed countless teasers and money-line wagers, including multiple five-figure money-line bets at Caesars Entertainment. The play resulted in a seven-figure swing at William Hill alone, and MGM Resorts reported a six-figure swing. Making the loss more painful for Pats bettors was the fact that they were on the cusp of covering. Forget Stephen Gostkowski missing an extra point and 42-yard field goal try and Tom Brady taking a sack at the Miami 9 to end the first half. New England had a chance to push the lead to nine as it faced first-and-goal at the 7 with 1:50 left. But the Patriots opted for three straight runs up the middle before settling for a field goal to give the Dolphins one last chance. Stoneback said it was one of the top two or three NFL Sundays of the season for his book. Not surprisingly, underdogs dominated, going 9-5 ATS with seven outright upsets by the Dolphins, Colts, Browns, Jets, 49ers, Raiders and Bears. Oakland beat the Steelers 24-21 as 10-point underdogs in one of the biggest upsets of the season and best games of the day for the books. Castaneda, who recently replaced Johnny Avello, said one Wynn bettor lost a six-figure money-line wager on Pittsburgh, which closed at minus 650. Another Wynn bettor lost a six-figure straight bet on the Chiefs, who rallied for a 27-24 overtime win over the Ravens but didn’t cover the 6½-point spread. Besides the Raiders and Ravens, books won big on the Browns and Colts, who beat Houston 24-21 as 4-point underdogs to end the Texans’ nine-game win streak. Cleveland came from behind to beat Carolina 26-20 as a 1-point home ‘dog. The books capped off another banner day when the Bears beat up the Rams in a 15-6 win Sunday night as 3-point home ‘dogs in a game that generated heavy action at Station Casinos. “This was one of the highest bet handles, similar to a playoff game,” Sunset Station sports book director Chuck Esposito said. The Westgate SuperContest consensus top five (Colts, Chiefs, Rams, Bills, Giants) went 2-3 for the fifth straight week to fall to 36-34 on the season. The SuperContest Gold top five went 2-2 (Eagles, Colts, 49ers, Bills) to run its season record to 37-27-5 and has the Vikings (+3½) over the Seahawks on Monday night. Team Cleveland 1 went 5-0 (Browns, Dolphins, Bears, 49ers, Raiders) to take the lead in the SuperContest with a 50-17-3 record (51½ points). However, @Pigskin_Junkies — which went 2-2 (Browns, Packers, Bills, Patriots) to run its record to 51-18 — can reclaim first place Monday if the Seahawks cover.